Vice President Yemi Osinbajo assured the victims they would be resettled after the flood. Residents of some communities in coastal areas in Nigeria are getting sacked from their homes daily by flood waters. Asaba, the capital of Delta is one of the cities where this horror has been recorded. 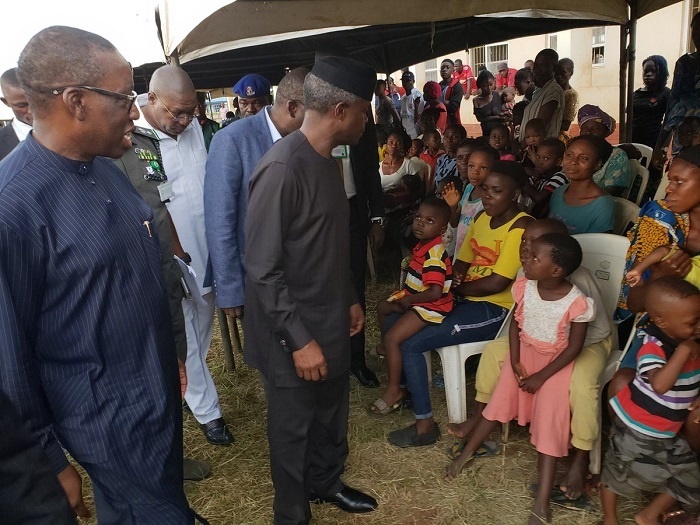 On Thursday, the Vice President, Professor Yemi Osinbajo visited the affected persons where they were putting up at Ogbeafore Primary School in the Institute of Continuing Education, Asaba. They were in a needy situation and Professor Osinbajo ordered the National Emergency Management Agency (NEMA) to urgently supply additional relief materials to all the Internally Displaced Persons (IDPs) camps. Osinbajo also assured them that the Federal Government would resettle the victims after the flood waters subside. He commended the state governor, Senator Ifeanyi Okowa, for his timely intervention by setting up the camps to take in displaced persons. So far, 12 states of the federation have been impacted by flood and four of the states, including Kogi, Delta and Anambra have been declared a national disaster. The VP said that the federal government and all its agencies would be working with state authorities. On his part, Okowa said he was glad that the people had decided to leave their flooded communities to seek refuge in camps, adding that with what he saw, the flood challenge would not be over soon.